Manouch Moshayedi and his Rio Racing Team finished the final day of Yachting Cup with a 1st place in Race #7, followed by Fox placing 2nd. Due to the extreme weather conditions, including heavy rain and 6-8 foot swell on the Ocean Courses, the SDYC Race Committee chose run the final day of racing in San Diego Bay on the 10 mile “Hot Rum Heavy Weather Course”. Because of these heavy weather conditions, BadPak and Invisible Hand did not race on the final day because of minor issues with underwater faring components that were non structural. 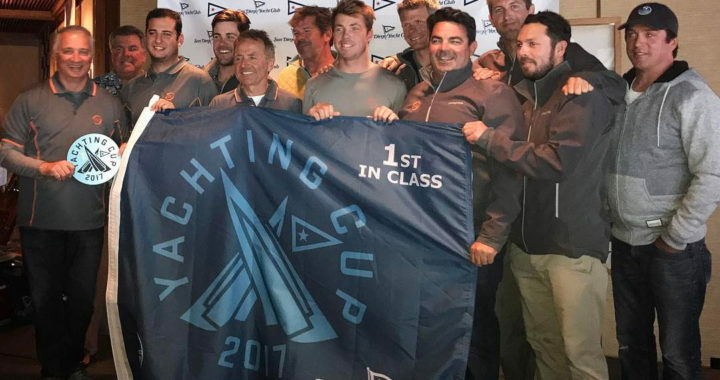 After a quick owners meeting, members of the BadPak and Invisible Hand teams hopped on board with the Rio and Fox teams for a fun final race day that will count towards Yachting Cup but will not count towards the Pac52 season scoring. BadPak finished 3rd in the Regatta and Invisible Hand Finished 4th. Next up for the Pac52 Class is the Offshore One Design Championship in Newport Beach, California in June.